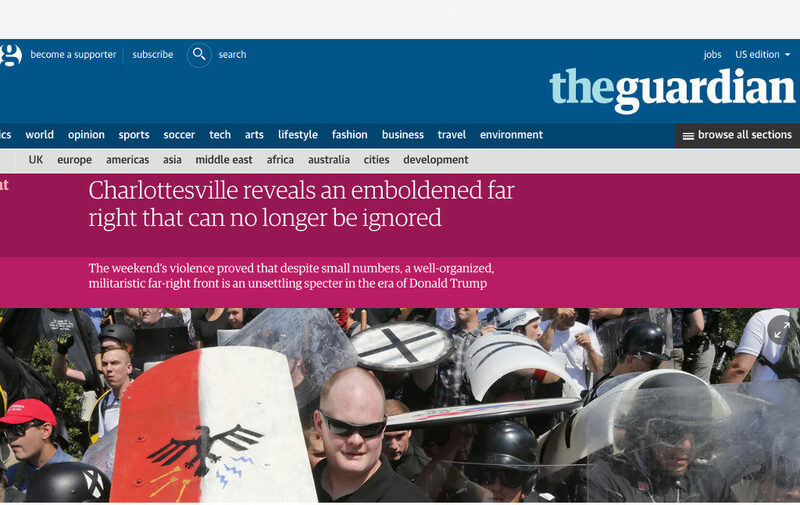 After Charlottesville, Current Affairs released an article called “How To Write About Nazis” as a guide to the press for covering the far right. Disturbed by the way that journalists and commentators had dangerously elevated the status of (and even romanticized) neo-Nazis, and concerned with the effect this might have in causing people’s attention to be disproportionately focused on fringe groups, Amber A’Lee Frost encouraged the media to be cautious and calm. Frost said that the press needed to avoid playing into the hands of neo-Nazis themselves, by portraying them as a more significant force in American political life than they actually are. The article cited a number of examples of what not to do in covering the far right, including taking glamorous photographs of white supremacists and implying that the country is about to be swarming with gangs of roving Brownshirts. Just writing about the newly published Amber Frost article, which used my reporting to illustrate a “don’t”. … I’m just wondering, was Amber in Charlottesville? Has she covered many previous far right rallies? Just looking to clarify where and how she came to the conclusion that my reporting of higher level of organization there was sensational, “inaccurate”, and sublimative of reality. Any update on this question? Where and how did Amber decide that I was misrepresenting what happened in Charlottesville? Well this is puzzling. 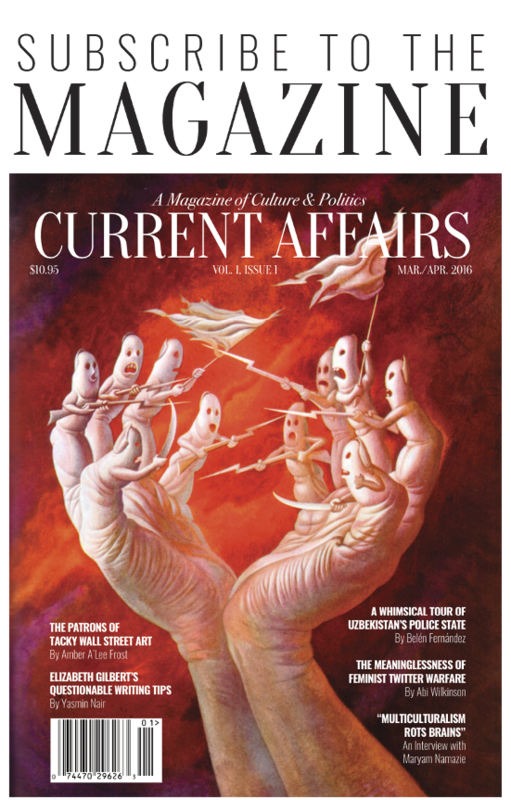 Current Affairs says I misreported the situation in Charlottesville, and I can’t even get an email back from its editor. You can see why a professional writer might be concerned by accusations of “inaccuracy”. I can’t quite understand why a professional editor wouldn’t immediately respond to the concerns of someone so accused. One more time, then. Could I please ask where and how Amber determined that my reporting of the situation was inaccurate, sensational etc etc etc. It really shouldn’t be this difficult. Originally, I chose not to comment, because although Wilson is a journalist at a major newspaper, part of me felt that he was not actually interested in getting a serious answer to the questions he asked. Now, however, several other left-wing journalists have suggested that Current Affairs has acted unprofessionally. Doug Henwood, contributing editor at The Nation, says that we “smeared” and “slimed” Wilson and should address his objections. Chip Berlet, a major investigative journalist who has studied the far right for decades, called our article “sneering journalism without research” and “obnoxious sneering pedantry,” “so arrogant and uninformed about reality that it criticizes journalist Jason Wilson (PhD) as being naive and panicked in his coverage.” Because I respect both Henwood and Berlet’s writings, and I take seriously the charges made against Current Affairs, Frost, and myself, I will explain and defend the characterization. Wilson asks on what grounds it is possible to conclude that he has presented “sensationalism.” Berlet criticizes the passage for the sentence “we don’t know just how organized the far right are,” saying that, in fact, people like Berlet do know this and have been studying it for decades. Berlet and Wilson both suggest that it is outrageous for Current Affairs, an outlet that has not been on the ground reporting on far-right movements, to criticize Wilson, who has. Frost’s original article singled out the phrase “organized, effective street fighting force.” The reason this is a misleading phrase to use is that there is nothing resembling an organized, effective Nazi street fighting force in the contemporary United States. If you don’t believe me, go and look outside. Go and wander the streets of every city in America and look for Nazis. Unless you happen to show up at one of the rare times at which white supremacists are holding some (usually pitifully small) rally, what you will see is… nothing. Where’s the street-fighting force? The problem is that Wilson is extrapolating from what happened in Charlottesville one weekend (which required assembling far-right groups from all over the country, since their individual local numbers are so tiny) to draw sweeping conclusions about the United States a whole. He is committing a logical error, which is to take a highly unrepresentative incident as the sign of a broader trend. It’s exactly what journalists usually do, and it turns people stupid and makes them pay much more attention to lurid but uncommon harms than to ongoing and more widespread but less sensational harms. To defend his characterization, Wilson sent me the dictionary entry for the word “rudiments,” which refers to the beginning of something rather than the full existence of it. In fact, the use of the word “rudiments” shows how deliberately Wilson is trying to mislead his readers. After all, it’s a word that could cover a lot of different possible scenarios. A Nazi party in every city in America, with a half-dozen uniformed men roving the streets, would have the rudiments of an effective street fighting force. But because the word just means the “beginning” it could also refer to a situation in which the Nazis have almost literally nothing. A single man standing on the streetcorner could be the “beginning” of something. Wilson’s use of an imprecise word allows him to terrify readers without actually having to be specific about the relative amount of support for neo-Nazism in the country. Every part of Wilson’s writing is calculated toward inflating the broader significance of the Charlottesville incident. He says that while the numbers may appear small, the Unite the Right demonstration was more important than it seemed. This was because it also happened to be unusually well-organized, meaning that white supremacists not only have growing numbers, but growing effectiveness. Look, however, at the sort of evidence he produces for this. A sign of their “growing tactical acumen” is that they didn’t just “show up” but had “assembly points,” i.e. each subgroup met at a different place. There were “were unified chants and even a disconcerting mass grunting,” and “disciplined, ordered movement.” What Wilson is doing here is trying to select the most organized aspects of what he saw in order to prove that the far-right is well-organized. But the evidence borders on the silly: “chants,” which frequently arise spontaneously, are evidence of organization, “ordered movement” could mean simply walking together and we are supposed to interpret from the fact that they “grunted” together (disconcertingly!) that American white supremacists are now on the brink of having an effective street-fighting force. It’s clear that Wilson is trying to inject significance into what he saw. Wilson quotes the part about the militia looking like an army, with “better equipment,” leaves out the first and last part of the quote, and then tells his readers that McAuliffe was “explaining” that police took a “hands-off approach because they felt outgunned,” allowing the white supremacists to “systematically terrorise a small city for an entire weekend.” This is outright misrepresentation of what McAuliffe said. Furthermore, McAuliffe’s statement was wrong. The state police outright denied that the militia groups had “better equipment” then the police. And Reason pointed out that this statement ignores just how militarized local police forces have become. Virginia has received millions of dollars worth of surplus military equipment from the Pentagon, through a program that distributes “M-16s, body armor, grenade launchers, bayonets, and armored personnel vehicles.” If Charlottesville police did not bring out heavier weaponry and armor than the demonstrators, it was not for lack of access to it. The perception encouraged by Wilson, that police are outmatched by militias, is dangerous, because it can be used by police forces to justify continued increases in their militarization. The greater the militia bogeyman, the more an increase in state power can be seen as necessary. There is good, reason, then, why I don’t trust Wilson’s reporting and neither should you. It’s not just that he’s clearly on one side of this and sprinkles his work with value-laden words like “cowardly” (a word I hate because of its goading-toward-violence quality). It’s good to be against the Nazis. The trouble is that, when you’re covering something you hate, you have to be very careful not to let your view on the underlying moral issue (where bias is good) to impact your portrayal of the factual reality (where bias is bad). Every part of Wilson’s article reads like a legal brief for the proposition that the neo-Nazis are about to be an organized force in the streets that people should panic about. If a fact can be interpreted to support this conclusion, Wilson will use it to support this conclusion, even if the fact could be interpreted another way. So if a grunting could be a sign of organized Nazi strength, or it could just be… some people grunting, Wilson will make it a sign of organized Nazi strength. If McAuliffe’s statement could be taken to mean that he thinks the police did a good job, or (somewhat less plausibly) to mean that the police were afraid to confront the Nazis, Wilson will take it to mean that the police were afraid, without asking for clarification. This kind of journalism is “hysterical” and “sensational” because it is prone to blowing up the meaning and significance of everything: assembling at different points becomes a sign of tactical acumen. The fact that “white polo shirts were notably popular” means that “the martial formations were matched by the militaristic appearance of these groups.” Every piece of evidence is treated as a sign, rather than evaluated in a nuanced and careful manner. It is, as “How to Write About Nazis” suggested, the kind of reporting we need less of. 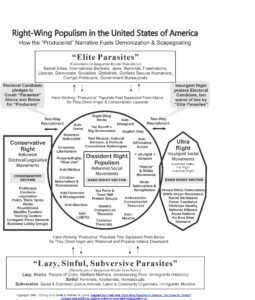 What of Chip Berlet’s view that Current Affairs has wrongly implied that the state of the far right’s organization is unknown, when experts like Berlet study it all the time? Here I think it’s important to draw a distinction between how much we know about what the ultra-far-right is like and how much we know about how politically significant the ultra-far-right is. (Since I see how experts like Berlet could mistakenly interpret the original framing as a dismissal of their work, if I were going back and re-editing this article, I would make sure this distinction had been made clear.) Berlet is right: there is a lot that is known about these groups. He has written books about them. The Southern Poverty Law Center has devoted considerable resources to tracking hate organizations. They even have a map. How is it, then, that we can say we “don’t know” what the state of things is? Well, frankly, it’s because those who study the topic, like Wilson, Berlet, and the SPLC, are generally quite weak when it comes to putting far right movements in perspective. They are very good at following these groups, examining their ideology, classifying them, tracking their connections to one another. What they are bad at is trying to figure out how much they really matter. As a result, they tend toward a kind of “Nazis under the bed” hysteria that irresponsibly frightens people about things they are not necessarily under serious threat from. The problem was — and, indeed, still is — that almost nothing is known about the party’s actual presence in the neighborhood. Does Golden Dawn really have an office in Astoria, the center of the city’s Greek community? That is not clear. What are its goals? Also unclear. Is its membership significant or minimal? No one knows for sure… As far back as two years ago, one local resident says, he saw a car in the neighborhood with a Golden Dawn bumper sticker. “The recruitment pool”! This makes it sound terrifying, of course. It sounds like there are five million people primed and ready to be neo-Nazis. There weren’t then, though, and there aren’t now. 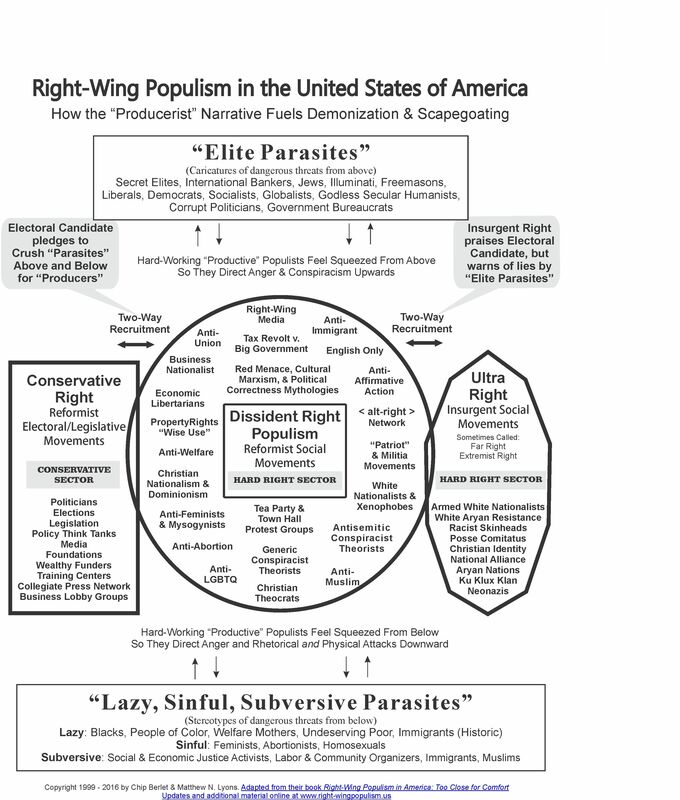 In order to think there are, you have to do what Berlet does in the above diagram, namely view Tea Partiers as the recruitment pool for the Nazis. Which they would be, if Nazis were an effective political movement. But Nazis aren’t an effective political movement. Even the SPLC, which is trying its best to make Nazis seem scary, can’t make them look like one. There’s actually an important irony here: if you want to know about the significance of far-right movements, the people you should ask are not necessarily those who study far-right movements. That’s because they’re going to be prone to thinking these movements are more powerful than they are. Wilson spends his time traveling from far-right demonstration to far-right demonstration across the country. Of course he thinks the U.S. is full of far-right demonstrations! If all you see are Nazis, you’ll see Nazis everywhere. But in order to get some perspective, you probably need to be a person who doesn’t spend their time immersed in this world. One last thing: I am not downplaying the threat of right-wing politics and racism in America. Donald Trump is the president, after all. But I tend to think that the biggest threats from the right come from the Republican Party, not the Klan and the Dominionists and the neo-Nazis and whatever Richard Spencer’s thing is called. (Even Spencer’s hometown hates him.) And when we fixate on the outright fascists, the people who have “organized street forces,” we are missing the more significant threat, which comes from the halls of state capitol buildings. You can (and should) care about both threats, of course, but it’s important to keep them in proportion, to weight each in accordance with its power and consequences. And it’s not that Berlet and Wilson are necessarily wrong that the white supremacists are rising, it’s that they are not trustworthy guides, because they don’t respond to the tough questions or show an instinct for self-criticism. And that’s why I think it’s perfectly fair for us to say that the state of the far right is unknowable. It’s unknowable because those who study it don’t seem committed to evaluating it cautiously.